Accountancy firm PricewaterhouseCoopers have taken responsibility for the mistake that led to the wrong film being announced as the Best Picture winner at the 2017 Oscars. Presenters Warren Beatty and Faye Dunaway erroneously announced ‘La La Land’ as the winner before recanting revealing ‘Moonlight’ was the actual winner. In an official statement released by PwC said a representative of their firm handed the presenters the wrong card before they went on stage. “We sincerely apologize to Moonlight, La La Land, Warren Beatty, Faye Dunaway, and Oscar viewers for the error that was made during the award announcement for Best Picture,” the statement read. 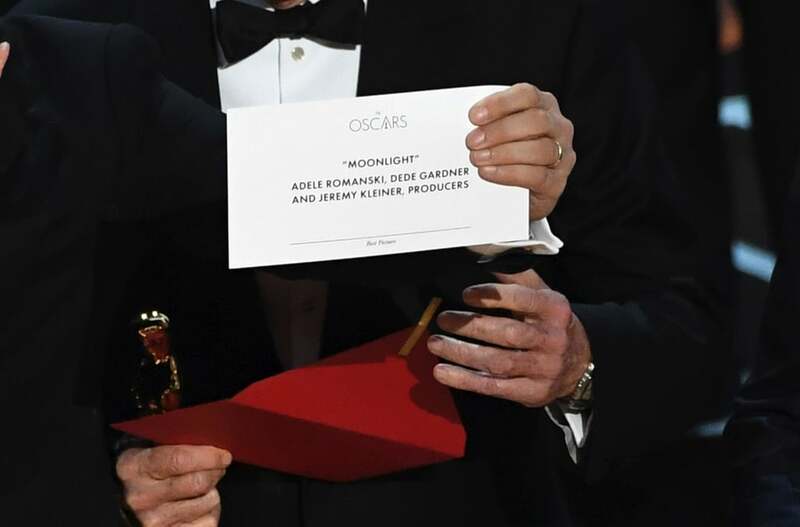 “The presenters had mistakenly been given the wrong category envelope and when discovered, was immediately corrected. We are currently investigating how this could have happened, and deeply regret that this occurred. PwC brings two sets of envelopes containing the winners to the ceremony and the duty of handing the cards to the presenters falls to two PwC balloting leaders Brian Cullinan and Martha Ruiz. They stand either side of the stage in the wings ready to hand the correct card to the presenter as they walk out on stage. Clearly something went massively wrong at the most inopportune moment. The mistake wasn’t rectified for a whole two minutes after the incorrect announcement meaning the ‘La La Land’ cast and crew had already arrived on stage and started giving speeches before stage manager Gary Natoli came onstage to announce the right winner.